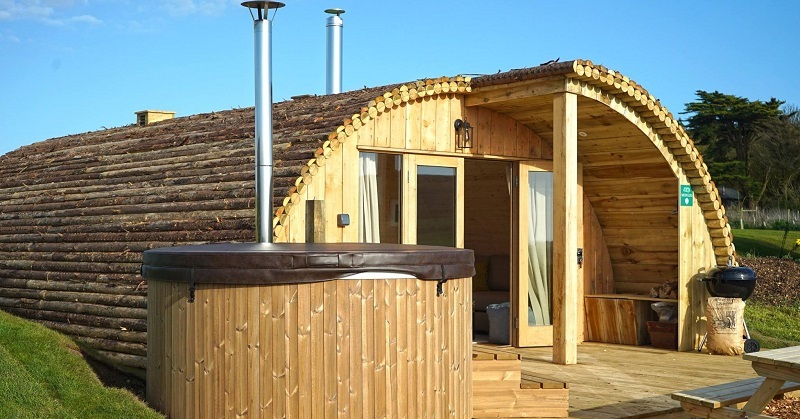 We have installed our glamping pods and cabins in established and new holiday destinations all over the U.K. and below are the details of places you can stay in a moduLog. If you are planning to add to or start a glamping site with a moduLog pod or cabin we will gladly add your details below and post pictures and forward notifications on our social media sites. We have over 4,500 and growing followers on social media with posts reaching new potential holiday seekers to your site. Any news post about your glamping site will also be posted on our blog page for all to see. 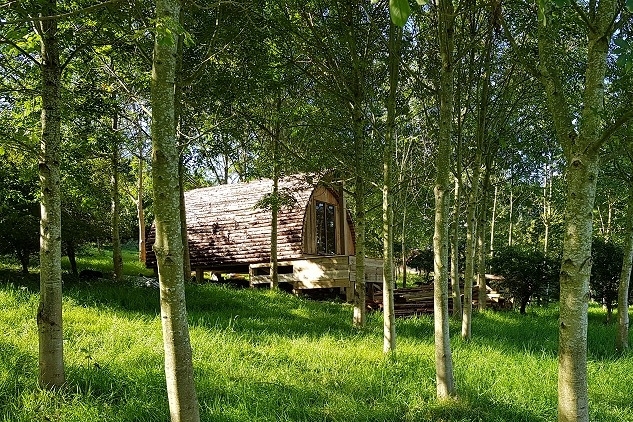 A woodland glamping park in the beautiful Wye Valley, Mid Wales. 5 moduLog pods which are off grid but fully equipped with a small kitchen, T.V./D.V.D player and log burner. As all of our pods are off grid they use Solar energy for LED lighting. Each glamping pod also has its very own outdoor deck and BBQ area and there is seating/beds and double glazed windows for you to take in the breath-taking scenery of the woodland and surrounding countryside. The Pemberton family invite you to share our view! Staying in a unique, handcrafted cabin in the heart of the Cotswolds. Stunning walks and cycle routes on our doorstop. Daylesford organic farm and Soho Farmhouse are just a 10 minute drive. The accommodation itself is great fun for families or a romantic hideaway for a couple looking to get away from it all. We look forward to welcoming you. A selection of accommodation and activities including Llama trekking can be found and this holiday park, set near the Cairngorm National Park. The moduLog onsite sleeps up to 10 with a log burning stove and kitchenette, totally off grid with solar panel for the LED lighting. Idyllic riverside setting in the heart of Wales. 4 moduLog cabins can be found at Irfon River Premier Caravan Park which offers the perfect location for your family holiday with its combination of stunning accommodation and scenery. Each cabin has a shower room and kitchenette with and outdoor BBQ area and deck overlooking the river Irfon. Tom’s Eco Lodge has a range of accommodation including 2 moduLog cabins which sleep 6 and have 2 bedrooms, kitchen, lounge, shower room, WC and large deck with hot tubs. The site in set in the glorious surroundings of Tapnell Farm, on the Isle of Wight. Stunning sea views, space to roam, and sandy beaches nearby create the perfect farm stay for an adventurous family holiday, relaxing group get together, and even a romantic hideaway. The Cabin is tucked away down a country lane. This moduLog cabin is suitable for 2/4 people, open living/bedroom area/kitchen and private en-suite with shower, and outdoor seating area. Apple Tree Cabin combines luxury with nature, relax in a very peaceful setting. 2 luxury moduLog cabins can be found here nestled in their own glades within 12 acres of woodland, offering you peace, tranquillity and a great base to explore the North York Moors and nearby beautiful coast. Cabins include a shower room, double bed, kitchenette and stunning views. For all who own something a little bit different. If you have Airstream,Caravan,Van,Tear Drop or Canvas...We would love to see all you Glamorous Tourers at Ettie's Field. If you have never Glamped before why not rent one of our resident Airstreams including our Ettie herself..!! This moduLog glamping pod set in the heart of the Llyn peninsula in a peaceful secluded spot, surrounded by rolling fields. Sleeping 4 the pod has everything you need including a kitchenette, shower room, and a log burning stove for cosy stays. The pod is just a few minutes drive from many tourist locations including the beach side town Aberdaron, and just down the road you can find the coastal towns of Abersoch and Pwllheli. There are many places to visit nearby such as Bardsey Island, National Trust Properties, Cosy country pubs, beaches and coastal walks. Glamping @ 68 Degrees West. Wonderful glamping in the heart of the Brecon Beacons National Park. This new glamping site is perfectly located with crisp clean air and breathtaking views. With a Golf course, the market town of Brecon and the Nation park all on the doorstep its the perfect place for an activity holiday or a relaxing break. Opening in August 2018 this new glamping site is set in the Welsh Heartland. This moduLog cabin is perfectly placed for a luxury glamping break with sleeping for 4-5 and with large deck and hot tub. Not only within walking distance of Devils Bridge Waterfalls, Cwm Rheidol Mountain Railway you are also only a short drive from the sea side town of Aberystwyth. Just simply relax onsite or explore the Cambrian coast and Mountains, please visit brynllwyd glamping for more details. Glamping in the Scottish Highlands. Situated on the beautiful Sutor of Cromarty on the Black Isle this new glamping site will be opening soon. Each moduLog cabin has unspoilt views of the Cromarty Firth and the stunning hills and mountains of the Scottish Highlands beyond. A short woodland walk away is the charming village of Cromarty, with hundred years of history for you to explore. Just 30 minutes from the City of Inverness , 40 minutes from Inverness Airport and a 50 min drive to Loch Ness you have the whole of the Highlands to explore.